Carmen Ohio (inside) holds off stablemate High Reward to win the $120,700 Ohio Breeders Championship for two-year-old filly pacers in Sunday action at the Delaware County Fair. Delaware-based trainer Brian Brown was holding all the cards in the $120,900 Ohio Breeders Championship for freshman filly pacers, taking three of the top four places Sunday at the Delaware County Fair, including the top two finishers, Carmen Ohio and High Reward. When the starting gate released the field of eight, driver Ryan Stahl sent Carmen Ohio for the lead from post No. 1. Stablemate High Reward (Ronnie Wrenn, Jr.) was also sent for the lead, but had to overcome post 6. Carmen Ohio and High Reward traded the lead through the opening quarters of :28 2/5 and :59 1/5. Stahl quickened the pace in the third quarter in :1:27 3/5. Wrenn popped out of the pocket and tried to collar the leader but came up a neck short in 1:55 1/5. The Panderosa filly is owned by Milton Leeman, Steve Manning, Brent Meizlish and William Calvert. Sugar And Spite (Tyler Smith) took the third spot from another Brown trainee Ni Me Bonita (Dan Noble). In the $12,800 OBC Aged Pace, Docdor Friskie and Tyler Smith led gate to wire to win by a length over the pocket sitting Barley Up (Chris Page) in a stakes record 1:51 4/5. Docdor Friskie, the 5-year-old Feelin Friskie gelding, is owned by Miller Racing Stable of Greenville, Ohio. In My Dream (Brady Galliers) took the fastest of the three divisions of the $15,000 Buckeye Stallion Series for sophomore colt trotters in a lifetime best 1:55 1/5. In My Dream is a Winning Fireworks gelding owned by Galliers Racing of Defiance, Ohio. Secret Pro (Hugh Beatty) and Fleet Cessna (Dan Noble) took the other two divisions in 1:57 1/5 and 1:57, respectively. The pair of divisions of the Buckeye Stallion Series for three-year-old filly trotters were also contested. Infrontandforgetit (Dan Noble) scored in 1:56 1/5. In the second division, Cindi Hall (Aaron Merriman) was placed the winner after Kellie’s MVP (Ray Paver) was disqualified for interference in the first turn. Stephen Oldford, representing the Delvin Miller Amateur Drivers Association, won the Tim Fouts Memorial Driving Championship. 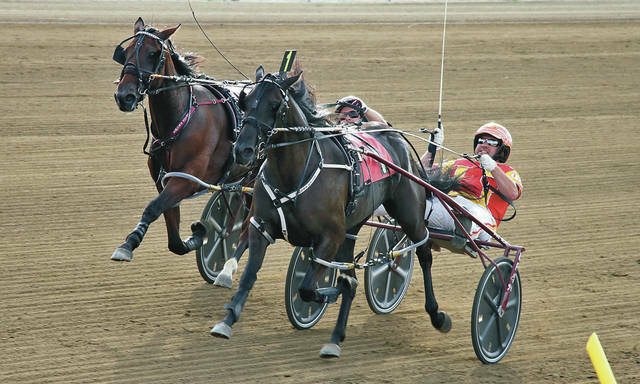 Oldford drove Arch Hanover to a 1:57 score over H-And-N Dho Hailey (Mariah Wright) and Badger Quinn (Alesha Binkley). The Fouts Memorial brings together representatives from amateur drivers clubs from across the country. The Billings Amateur Trot divisions went to I’ll Tell You What (Richard Roach) and Sebiskit Bluegrass (Joey Putnam) in matching 1:59 2/5 miles. Today’s 14-race card will start at 3 p.m., with the simulcast program on the air at 2:30. It features the $101,700 Ohio Breeders Championship for sophomore trotting fillies and a $5,000 guaranteed Pick 4 (races 8-11).